Posted September 12, 2016 by Rob Smedley & filed under Lists. 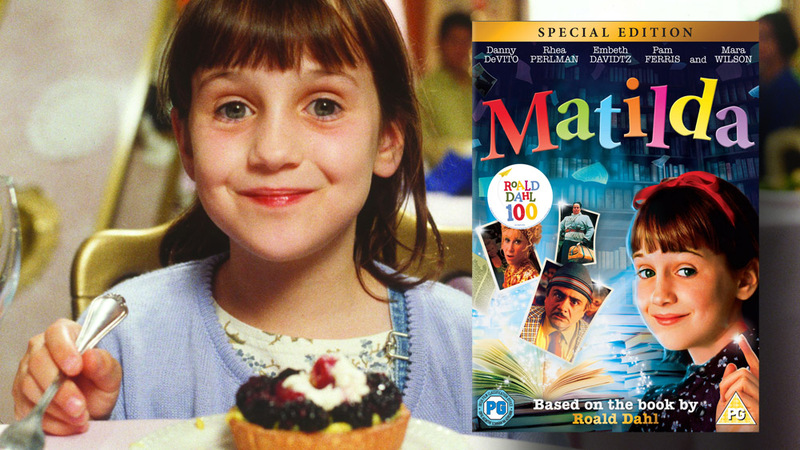 If you were a kid in the 90s then prepare yourself for a shock: Matilda‘s celebrating its 20th anniversary. Time flies like poor little Amanda Thripp and her pigtails, doesn’t it? Twenty years on, the cinematic adaptation of Roald Dahl’s bestseller has proved to be an enduring favourite with audiences of all ages; its latest anniversary prompting plenty of nostalgic sighs and fond celebration from people who were barely older than Matilda herself (and small enough to fit in the dreaded Chokey) when they first saw the film back in 1996. And that includes me. Anyone else still remember Miss Honey’s rhyme to help you spell ‘Difficulty’…? If you’ve not watched it since the last millennium (which, lets be honest, is a possibility), or if you’ve got children of your own who’ve never seen it, then it’s about time you telekinetically pulled the DVD/Blu-ray off the shelf and enjoyed it all over again. Not simply for the nostalgic thrill, but also because it’s still one of the most charming, terrifying, and heartwarming children’s movies ever made. Some will tell you that the most triumphant moment on the big screen in 1996 was when Earth beat the aliens in Independence Day. Those people are wrong, and obviously did not see the truly Herculean feat of one Bruce Bogtrotter being forced to consume a delicious-looking chocolate cake big enough to make even the hardiest Bake Off contestant flinch. Fistful by chocolately fistful he gulps it down in a perfect recreation of the novel. It’s a scene that both repulses and makes you hungry all at once, but ultimately fills you up (metaphorically at least) with triumph as the rest of the school cheer him on to lip-smacking, plate-licking victory. Miss Trunchbull’s reaction? Well, you have to watch, but it ain’t pretty. ‘Ahh, fresh meat!’, the terrifying Miss Trunchbull (a near-unrecognisable Pam Ferris) seethes with delight as she spies innocent little Amanda Thripp and her pigtails from across the playground of Crunchum Hall. By Trunchbull standards Amanda gets off lightly, but she has to go and say ‘But…’. And in a reaction that lies somewhere between Mr Bumble’s ‘MORE?’ from Oliver Twist, and a pro-wrestler’s hissy-fit, the ex-Olympian grabs her by her pigtails and performs a gold-medal worthy hammer throw, spinning the little girl round and round and tossing her clear across the playground. It’s a great line, a great piece of writing; not just because of the spittle-flecked way DeVito delivers it, but because it encapsulates both everything you need to know about her dad’s entire character, and everything that Matilda has to struggle against at home and especially at school. It sets up the entire theme of the film, and once it’s said, you can’t wait for Matilda to prove her dad wrong. In a scene that has the odd subtle nod to ‘A Christmas Carol’, and sees some fairly simple special effects applied to greta effect, Matilda uses her powers to haunt Miss Truchbull as she brazenly sits in what’s meant to be Miss Honey’s house. Look at her, scoffing those sweets and throwing javelins. Disgraceful. Okay, spoiler alert here, (if 20 year old spoilers can exist) but it’s worth it. Because in a movie all about a little girl with telekinetic powers, the most powerful thing Matilda does is nothing mystic or magical: it’s simply standing up to her parents and deciding that she doesn’t want to live with them and would rather live with Miss Honey. It’s a moment of empowerment that’s entirely real and entirely Matilda’s. Chasing Trunchbull out of the school may be the big ‘cheer out loud’ moment, but Matilda making a choice to change her entire future is where the real heart of the film lies. Buy Matilda on DVD on Amazon here. Follow Rob Smedley on Twitter here.